We urge our residents to adhere to the following post-hurricane safety tips issued by Miami-Dade County. Report power outages to Florida Power & Light online or call 1-800-4-OUTAGE (1-800-468-8243). At this time, residents can report property damage online through the Miami-Dade County, Office of Emergency Management, Neighborhood Damage Assessment Form. Residents should use mobile apps for County services, power outages, gas stations and traffic updates. Residents are encouraged to use the Miami-Dade County Contractor Licensing Section online search at: www.miamidade.gov/building/contractor-inquiry-search.asp to determine if a contractor is licensed, insure or has complaints or violations on record. Depending on where you live, insurance adjusters may not be able to get in right away due to downed power lines or flooding. Now is the time to pre-emptively reach out and let your agents know your home and vehicle have sustained storm damage. That helps insurers know where to go to look for damage, and where to find you in the coming days and weeks to provide additional assistance. Report your claim as soon as possible. After you file the claim, write down your claim number and keep it handy for easy reference. Keep receipts for any expenses related to immediate repairs you had to make to secure your home as well as any living expenses if you could not return to your home in the wake of the storm. Anyone who suffered damage due to Hurricane Irma can apply for assistance from FEMA. Miami-Dade County has been approved for assistance. You can be either a homeowner or a renter to qualify and you don’t necessarily have to be insured. Visit disasterassistance.gov or call FEMA at 1-800-621-FEMA, between 7 am and 11 pm. For more information on FEMA disaster assistance reimbursement and claims visit: www.fema.gov/disaster/4337. FEMA provides disaster assistance for individuals. For more information on the FEMA Individual Assistance Program, view this FEMA Fact Sheet. The Federal Emergency Management Agency (FEMA) Public Assistance (PA) Program provides supplemental assistance to States, Territories, Tribes and Local governments, as well as certain private nonprofit organizations, (herein referred to as Applicants). FEMA’s Public Assistance Program and Policy Guide (https://www.fema.gov/media-library/assets/documents/111781) provides comprehensive information regarding FEMA assistance and the requirements that Applicants must meet in order to receive assistance. Download the below fact sheet which provides key information to consider when planning for debris removal. A Disaster Recovery Center is now open in Miami-Dade County – at Miami-Dade College Kendall Campus Building K, 11011 SW 104th Street Miami, FL 33176. Disaster Recovery Centers offer in-person support to individuals and small business owners. Recovery specialists from the Federal Emergency Management Administration (FEMA), the U.S. Small Business Administration (SBA), and the State, are available to provide assistance to anyone with filling out applications or updating their status. Voluntary organizations are available and offer a variety of services to help survivors recover. For more information visit: www.sibfl.net/drc. The U.S. Small Business Administration’s (SBA) low-interest disaster loans are the primary source of federal assistance to rebuild disaster-damaged property. SBA offers low-interest disaster loans to businesses of all sizes, private nonprofit organizations, homeowners and renters. As of Oct. 1, SBA has approved 238 loans for more than $10.6 million in Florida. Applicants may apply online using the Electronic Loan Application (ELA) via the SBA’s secure website at disasterloan.sba.gov/ela. Floridians struggling with the after effects of Hurricane Irma could be eligible for help buying food through USDA’s Disaster Supplemental Nutrition Assistance Program (D-SNAP). Information on Disaster SNAP (Food for Florida). The State of Florida has been awarded the Federal Dislocated Worker Grants to provide temporary employment to Floridians affected by Hurricane Irma. The Dislocated Worker Grants, administered by the Florida Department of Economic Opportunity, provides disaster relief employment in the form of temporary jobs that support storm response and recovery efforts. For information regarding National Dislocated Worker Grants, visit your local CareerSource Center at www.careersourceflorida.com/your-local-team. Find and apply for Hurricane Irma Recovery jobs at the Employ Florida portal: irma.employflorida.com. Veterans impacted by Irma may be eligible for federal relief including rental assistance, relocation assistance and food vouchers. For more information, call Support Services for Veteran Families (SSVF) providers. This includes homeless vets, those doubled up and those with damage to property, loss of food and/or belongings. The Advocate Program: 786-227-5842 (Miami-Dade and Monroe). Carrfour’s Operation Sacred Trust: 855-778-3411 (Miami-Dade and Broward). Please note that debris pick-up services by Miami-Dade County only applies to single-family homes in Sunny Isles Beach that are already serviced by the County. All condominiums, hotels, commercial centers, office buildings, etc. that normally utilize private companies for bulk waste pick-up are responsible for the removal of their own debris. The first pass for hurricane debris collection by Miami-Dade County began the weekend of Sept 16 & 17. These post-hurricane debris pickups do not count against residents’ available bulky waste pickups. Debris collection will take time; please be patient. County crews are currently addressing curbside hurricane debris piles and contracted hurricane debris collection crews began pick-up this past weekend. Bulky waste scheduling remains suspended until further notice. Scheduling through 311, online, and through the telephone app is not available. There is no need to schedule hurricane debris collection. Residents are strongly encouraged to create two separate curbside hurricane debris piles – one for hurricane yard trash only and the other for household trash items such as furniture, carpeting, fencing, etc. Fencing can be placed at the curbside as hurricane debris. Keep wood, PVC and chain link fencing out of the piles of tree waste – as much as possible and where practical. Residents are reminded not to place trash on the right-of-way of private property or on vacant lots. Residential and commercial garbage service resumed on Tuesday, Sept. 12. Residents should place their carts at the curb by 7 a.m. on their regular waste collection day. Where roads are still inaccessible, residents should leave their carts at the curb to be addressed by DSWM crews as road clearing operations continue. Residents who no longer have a garbage cart should order a replacement cart by calling 311. Curbside recycling service is suspended until Monday, Sept. 18. When service resumes, residents should follow their previously issued recycling calendar or visit www.miamidade.gov/solidwaste/recycling.asp to download the calendar for their home’s recycling route. The 13 Neighborhood Trash and Recycling Centers continue to observe extended operating hours from 7 a.m. to 7 p.m. until further notice. Service area residents can drop off household trash, yard waste and small amounts of hurricane debris. Guidelines regarding truck and trailer sizes are still being observed. 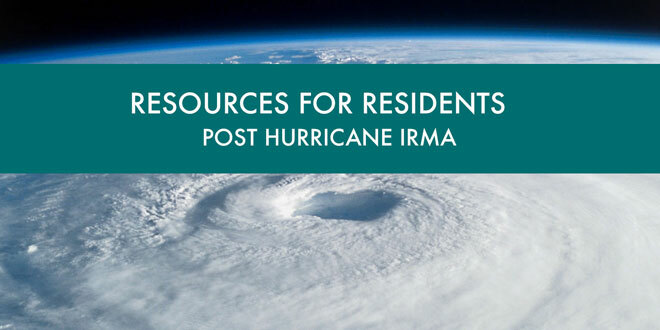 Residents who are not Department of Solid Waste Management service area customers should contact their city or waste service provider for trash or hurricane debris disposal options. All of the department’s commercial disposal sites are observing normal operating hours. Water in Sunny Isles Beach and all of Miami-Dade County is still safe to drink. There is no boil-water notice at this time. If you experience low pressure, it is recommended to proactively boil your water prior to drinking, cooking, brushing your teeth, washing dishes or making ice when service is restored. Price gouging during a state of emergency is illegal. To report violations, call the Price Gouging Hotline at 1-866-966-7226 or visit http://bit.ly/2f3454O. Please be safe and cautious when walking outside. Do not walk or drive through standing water. Avoid all downed power lines. Continue to check Miami-Dade County’s Emergency webpage at: http://www.miamidade.gov/emergency. Follow the City of Sunny Isles Beach on Twitter: @CityofSIB and on Facebook: @CityofSIB.